As mother of a 5 year old who has refused to wear anything but skinny jeans for the past two years, shunning all other legwear as “too puffy”, my recent shopping finds should come as no surprise. And yet, somehow, I’m stunned at the insidious spread of the dreaded JEGGING to children’s wear and beyond. I was in Old Navy one recent morning before work and wandered over to girls’ leggings to find, hanging alongside the ubiquitous multicolored leggings, baby jeggings. Just like mama owns, only in sizes from toddler to tween.. If somehow you missed the advent of the jegging, let me explain. It’s basically a denim jean in legging form, – so a super-stretchy blue jean, usually with an elastic waistband and often with jean-like stitching details – hence the unfortunate name, jegging. Besides the horrible name, I don’t object to the product per se. Who doesn’t love to pull on something comfortable that gives, tucks neatly into high boots or looks just as good with ballet flats. 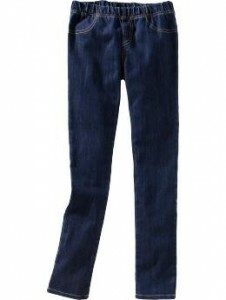 Jeggings – I love mine from Uniqlo – can look great. And then there’s the other side. It’s tricky for women to pull off the skintight silhouette, disguising womanly lumps and bumps under long tunics. Plus, I often feel badly that I resort to the legging look all too much, rather than structured clothing with zippers and buttons. It concerns me sometimes that we – me included – are rearing our children largely unaware of belts, buttons and shoelaces. That said, it seems the jegging, along with elastic and Velcro are here to stay. And not just in the children’s aisle. Legwear for men is getting an overhaul too, with man leggings – meggings perhaps – on the runways and already in some fashion forward retailers. The UK’s Daily Mail reported last month that men also are increasingly keen to wear tights. So much so that Selfridges in London has a range of man pantyhose – yep mantyhose – designed exclusively for guy-sized legs. The mantyhose are made by lingerie brand Unconditional and are a sturdy 120 denier thick. At about 70 GBP a pair or roughly $111 US dollars, the look doesn’t come cheap and really, hipster, fashionista, whatever, this just cannot be a good look en masse. It’s nothing new of course; think court jesters, ballet dancers, some athletes, Superheros and rockstars – meggings and mantyhose have been on the radar for years. But in 2010/2011, unless you’re Spidey or glam -metal rocker Bret Michaels, perhaps stick with a manbag instead. I love this vintage button pin featuring graphic art by Carol Summers, a master American print maker renowned for his intensely vivid colors and woodblock techniques. 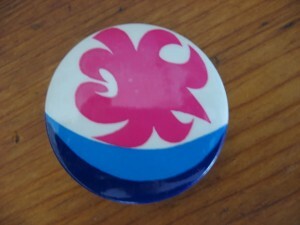 The pin is stamped 1971, and may have some collectible value as do Summers’ prints. The Santa Cruz resident has works in museums including The Art Institute of Chicago, Biblioteque National in Paris, New York’s Museum of Modern Art and Brooklyn Museum of Fine Arts. But for me, the cool vintage pin – purchased from my favorite online vintage store http://www.riceandbeansvintage.com/– is all about wearable art. I plan to use it to drape and pin into place some of my oversized, slouchy winter sweaters. Or maybe I’ll pin it on my bag the way my kids do with their superhero pins! I’m also loving this Claudia Pearson poster for its bright cheekiness. It’s the first in a series of hand-drawn type posters featuring some classic and some more obscure song lyrics. 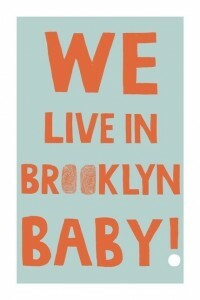 This one was inspired by Roy Ayers “We Live in Brooklyn Baby!” Pearson, a Brooklyn local, has been published in the New York Times, Elle, The New Yorker and The Big Book of Illustration, among others. She also has one children’s book and is working on another. Besides prints like the one pictured, her illustrations are available on tea towels, totes, cards and books. You can find her work in her etsy store. I am not the crunchy, granola-making sort BUT I am having a clog moment as the weather turns and the Havaianas no longer cut it to run the kids to school on a chilly, wet morning. Plus, I am not very good at wearing shoes. Seriously, no matter what shoes I wear I manage to end up with red, chewed-up heels and other assorted blisters and bumps. I am obviously meant to be barefoot but since that isn’t practical roaming the Brooklyn streets, clogs – which have no back – seem like a practical alternative. What’s more, they could work well with the whole knee-high-sock-trend that’s promising to be big this Fall. I haven’t owned clogs since I was a very young girl back in Adelaide and probably still in primary (elementary) school, and I probably haven’t worn knee-high socks since then either – but this Fall, it’s all about to change. 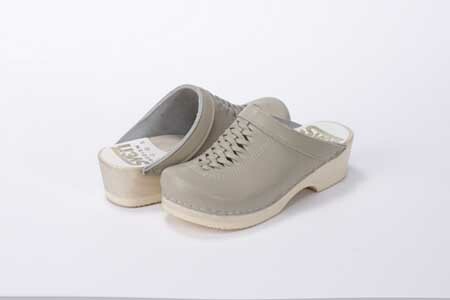 I like the lightweight Sven clogs, available online or at Refinery on Smith Street, the go-to for Brooklyn women searching for clogs or the other staple Saltwater Sandals. I know there are much fancier and pricier clogs out there right now, but I’m thinking Sven might do the job and be a good “trainer” clog so to speak. My thanks to fellow writer Kate Godin for pointing out this incredibly divine example of Australian fashion. It channels the inner ballerina in all of us methinks, and redeems the nation after the travesty of a “national costume” that the Aussie Miss Universe contender plans to wear in Las Vegas next month. 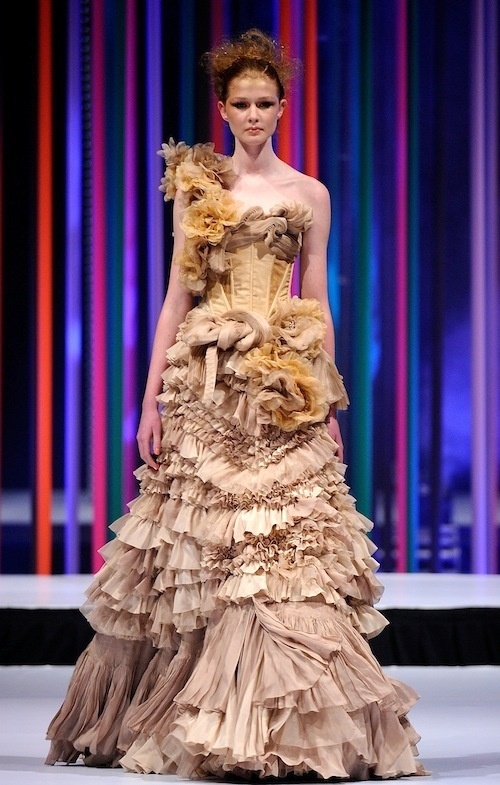 This puff of gorgeousness is a design by Aurelio Costarella, modeled during a StyleAid Perth 2010 event in Perth, Western Australia. Aurelio Costarella launched his ready-to-wear and couture brands in 2000 in far-flung Perth and has gone on to dress celebs and socialites from Rihanna and Sharon Stone to Leelee Sobieski and Dita Von Teese, as well as grace Fashion Week runways locally and abroad. Thank you to Aurelio Costarella and this beautiful dress for restoring my faith in fashion down under and bolstering hope that the dreaded high-heeled Ugg boot won’t stray from the pageant catwalk and onto Main Street. When you switch on the TV come August 23 to watch the Miss Universe pageant, which I know you all will, please disregard this crazed ensemble on Australia’s entrant. High-heeled Ugg boots, a sheepskin shrug and a cutout cossie, that’s a swimsuit in Oz-speak: Is this really worthy of a national fashion identity? Please, Ugg boots shouldn’t be seen outside of your cold apartment in the dead of winter, or at least that’s my take on them, let alone adorned with heels and on a catwalk. Hideous. But, what do I know. Jesinta Campbell, the 18-year-old Aussie pageant queen, is chuffed with the costume, which she will wear to represent the land down under in the national costume section of the contest. “Isn’t it incredible,” Campbell said when revealing the outfit, which a-la-pageant style also reveals plenty of her. Well, yes Jesinta, it is incredible, in the same way that the Crocodile Dundee stereotype was incredible, and horribly embarrassing. The costume was designed by Sydney’s Natasha Dwyer who works under the Arthur Ave label, and the swimsuit bares a design hand-painted by an Aboriginal artist. To be fair, I actually don’t loathe the multi-layered skirt, but I am not sure how it really speaks to Australia. Perhaps the color palette is reflective of the earthy reds and ochres of the landscape, and common in indigenous art. Or perhaps Jesinta is headed to Rio for Carnival after her Las Vegas jaunt? Please, before you judge Australian fashion sense based on this national garb, think Sass & Bide, Lisa Ho, Peter Morrissey, Richard Tyler, Collette Dinnigan, Carla Zampatti – there are plenty of great designers to emerge over the years, and they really are incredible. Oh and feel free to smack me silly if heeled Ugg boots catch on! There’s movement on Columbia Street again. Brooklyn Collective is moving to its own digs and expanding to include artists’ studio space and classes in cool stuff like sewing and silk screening. The Collective had been in a space at the back of vintage furniture store General Nightmare , which is shuttering once and for all. While demand for pricey antiques may be waning enough to send the General packing, the cry for local handmade goods continues to thrive on the increasingly popular Columbia Street Waterfront, prompting the Collective to shift into a 1,500sq ft space that will open August 1. The Brooklyn Collective was founded in 2004 by locals Rachel Goldberg and Tessa Phillips, jewelry and fashion designers respectively, as a way to give other artists a place to display and sell their work. Member artists share the rent, hence the idea of it being a “collective”, and get to keep 100% of all profits from any of their creations sold. 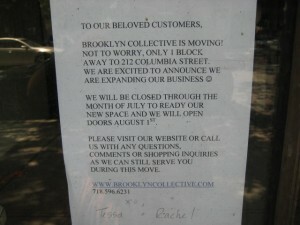 The Collective is closed through July and will reopen next month at 212 Columbia Street, next to Mazzat restaurant. As part of the expansion, the Collective will be offering studio space to local artists and classes, including sewing, photography, drawing, metal smithing and silk screening. Look out for a schedule in September. 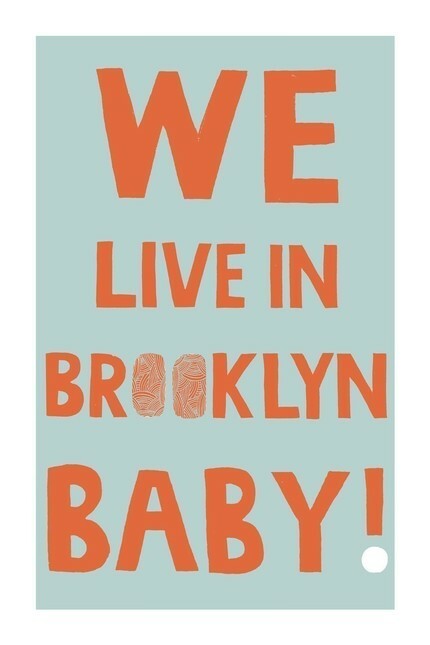 Brooklyn Collective parties are always fun, so stay tuned too for info about an opening event. Meantime, mainstay General Nightmare at 196 Columbia is calling it quits, with just a scrappy note in the window advertising a closing down sale to get rid of the last of the furniture before turning out the lights. The store, once cluttered with antiques and mid-century treasures, had long been a favored hunting ground for locals and visitors alike in search of something obscure or specific. My husband and I have scoured the basement on occasion in search of Eames chairs and ottomans. It was like slipping down the rabbit hole into a crazy garage sale. General Nightmare survived and grew even after the death in 2005 of its well-known owner and Columbia Street pioneer Barry Jetter, with partners taking over and sprucing the place up a bit. But even as the Columbia Street Waterfront is “discovered” almost weekly by one publication or another, and new spots move into the neighborhood, ailing demand for antiques and rental drama apparently encouraged the closure. When I gave up at the DVF sample sale opening day, I headed downtown along Sixth Ave, and checked out the hot new Limelight Marketplace. 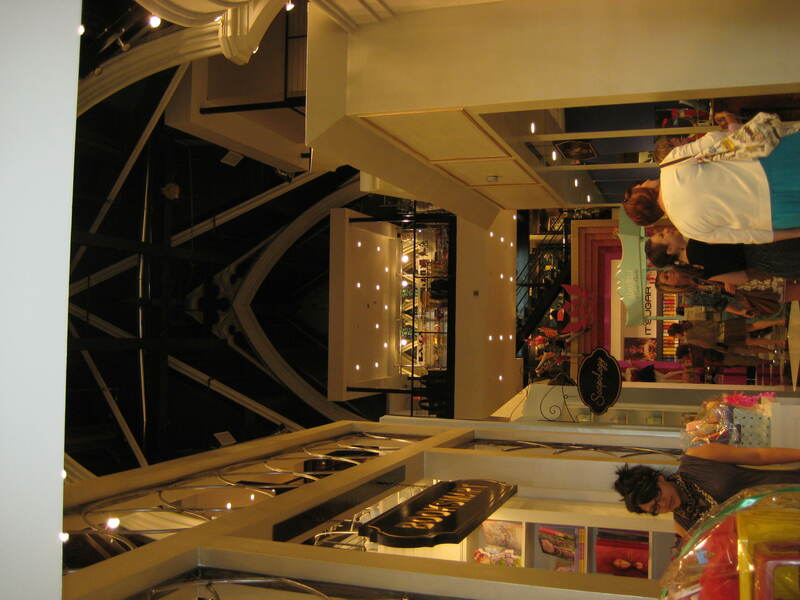 Inside the 163-year-old church-turned-nightclub, the shiny new market (mall?) is a candybox assortment of mostly high-end pop-up stores, with one of the prettiest and probably priciest “food halls” to boot. I picked up a new pair of Havaiana flip-flops at $18 but if it’s Petrossian caviar, Mariebelle chocolates or a bikini wax from J Sisters you’re after, the Limelight Marketplace has it. The marketplace is at 656 Sixth Avenue at 20th Street. It’s open Monday to Saturday 10am to 9pm, and Sundays 11am to 8pm. 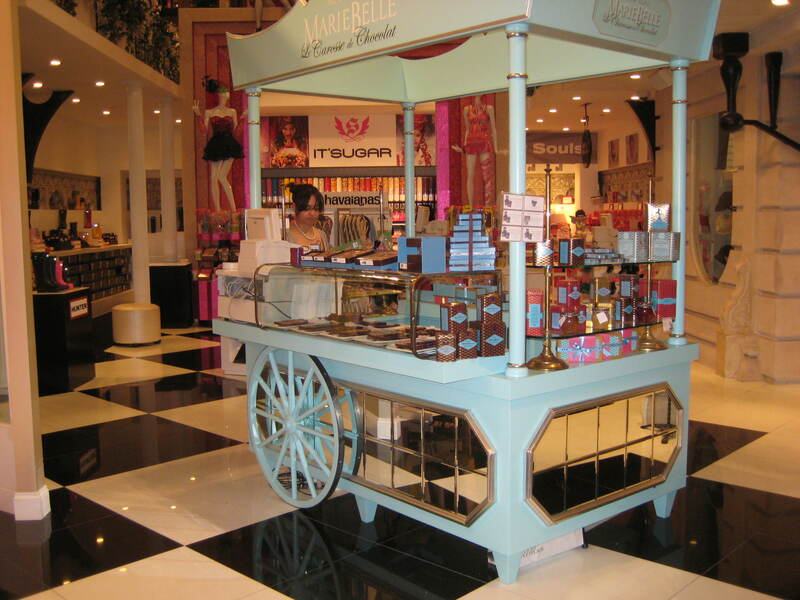 HavaianasJ SistersLimelight MarketplaceMariebelle ChocolatesNew Shopping MallNightclubOld ChurchPetrossian CaviarSixth Ave. I am not usually one to give up but the lines at the DVF sample sale did me in today. I was about 15 shoppers away from getting through that hallowed door when the cold (yep it was cold standing in the shade all that time) and the seemingly-endless wait made me farewell the new friends I braved the line with for almost one-and-a-half hours, and head elsewhere. I arrived right on 9am to find a line stretching along Fifth Ave. and around the corner to about half-way down 28thSt. There were at least 200 women at that stage, all around size 2-to-4, sipping coffee, trawling the Internet and making phone calls; it was a friendly, if antsy scene as we took bets on how long it would be before we could even see the door. 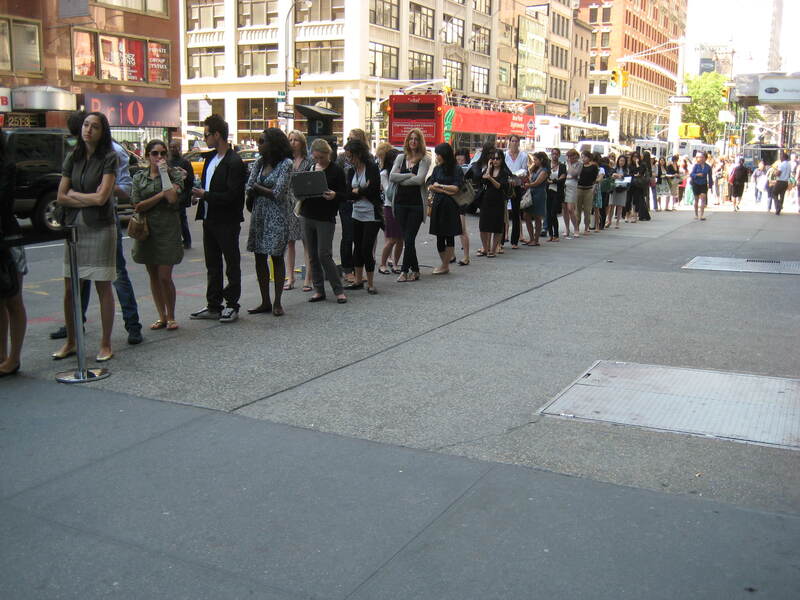 Some half-hour later, I made it from 28th onto the Fifth Ave. line, and then it took another 30 minutes to the front of that queue, at which point a suited young man with one arm in a sling, ushered us forward to the line outside the door. I gave it 30 minutes or so there before calling it a day. I had places to be and children to collect from school. I figured by the time I got through the bag check, looked around and possibly got on another killer line to pay, my children would be en route to a police station with child protection workers! Will I try again? Maybe. But for now I can report that the sale seemed to be some kind of black hole, people were let in – hundreds and hundreds of them – but they came out in dribs and drabs, and some people never seemed to make it out. 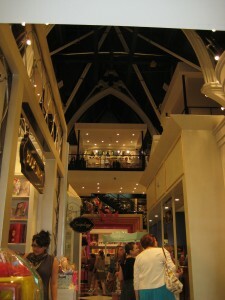 Mind you, pretty much everyone coming out did have a large white bag, so there was some shopping going on. A lot of people were pulling handbags from their shopping, showing that the demand for DVF accessories was alive and well. I’d love to give you tips on the best time to go, but frankly, I’m not sure that there is a good time. Certainly not first thing in morning when people stop-by on the way to work. And avoid bringing a large bag that will have to be checked, if you want to save time. Someone in line also suggested having cash, to cut the credit card queue. 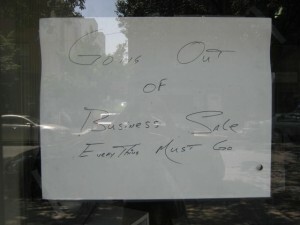 The sale is at 260 Fifth Ave. between 28th and 29th streets. It continues Wednesday 10am to 8pm, Thursday 10am to 7pm and Friday 9am to 3pm. I feel like a wrap dress is something everyone should have in the closet: Diane von Furstenburg’s iconic wraps are classic, easy-to-wear and and on sale this week. 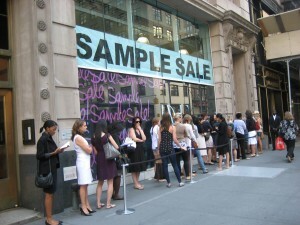 Get DVF’s boldly patterned summer styles for up to 75 percent off at the sample sale beginning tomorrow, Tuesday June 8. Signature silk jersey wraps that can take you from work to a wedding, cocktails to dinner, are marked around $150, down from $325. And swim cover-ups, including bright kaftans ideal poolside or at the beach, are $100 from $250. I’ll be scouring the racks in search of the Hesta dress pictured left, or anything similarly chic. The sale opens to the public from 9am Tuesday to 6.30pm; Wednesday 10am to 8pm, Thursday 10am to 7pm and Friday 9am to 3pm. It’s at 260 Fifth Ave., between 28th and 29th streets. 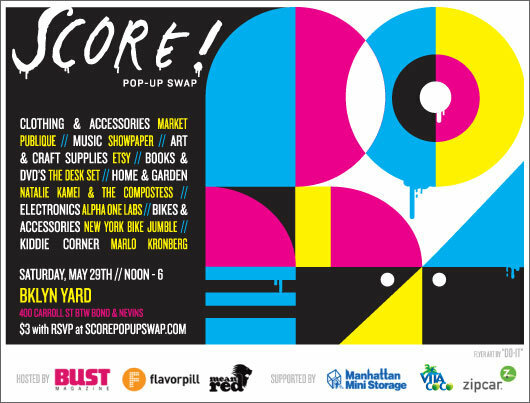 Ever wish you could clear out all of your old, unused, unworn, unread stuff and swap it for fresh things, be it books, clothes or cool homewares: Well, get thee to BKLYN Yard this Saturday, May 29 for the next pop-up “free store” Score! Here’s how it works: you take your old clothes, books, electronics and tsotchkes and drop them at the door, where volunteers sort them and distribute them to themed departments. Then professional curators – this time Etsy, Brooklyn hackerspace AlphaOne, vintage fashionistas Market Publique and the bookish crew from Desk Set are among the all-star curating team – pulling it all together and merchandising the unwanted items into boutique-like displays. Then, you get to go shopping for NOTHING. And while you’re loading up on freebies, there’s music and other artsy carryings-on to keep you amused. Anything left at the end of the day gets recycled or donated to charity. Departments this year have been expanded to include clothing for men and women, books + media, electronics, music, housewares, bikes, crafts and a kiddie corner. Start clearing out that closet, because the last two Scores! have drawn more than 1,000 people apiece. The only catch is there is a $3 cover with RSVP here; and $5 if you don’t RSVP. But hey, think of all the stuff you can offload and the new things to take home. Score! is on this Saturday from noon to 6pm at BKLYN Yard, 400 Carroll Street, between Bond and Nevins. In case it rains, the rain date is Saturday, June 5.